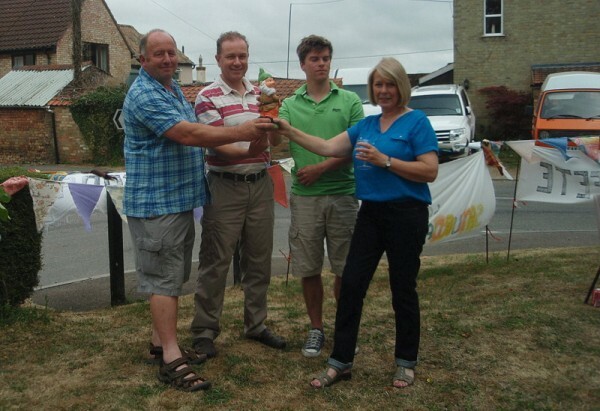 Team Gidding competed in a three team, three “sports” challenge at the recent Winwick Garden Fete. A competition based on Aunt Sally, Northamptonshire Table Skittles and 9 pin Outdoor Bowling on tricky terrain. The rules were sort of agreed and each team, Winwick, Hamerton and Great Gidding commenced battle. At the the final count Gidding had more points mostly by being able to hit the doll in Aunt Sally although the smugness was nearly wiped off when a later arrival (who will be known as Mrs S) for the Hamerton team hit the doll on the first three throws having never seen or played the game. We have named the trophy Call me “Dave” in solidarity with all the Dave’s and David’s that live in Winwick. We hope you had a good fete and there will be an opportunity to win back “Dave” in the near future.